← A Spring Morning With Chandler! 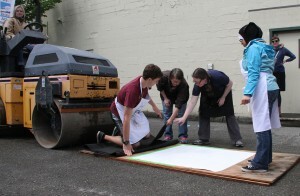 Amy McBride waits patiently on her “press” as Jessica Spring and Chandler O’Leary assist two artists in pulling a print. Looking out my kitchen window, I saw the omens were not good for the Tenth Annual Wayzgoose. Ominous black clouds sat on one horizon, less threatening dark grey clouds hovered on the other, with sheets of rain in between. I had forgotten, nothing spoils a good party. Perhaps it was the determined spirit of its participants and the sunny dispositions of the people who attended, or maybe it was simply to be, but whatever the reason, as the morning progressed, the clouds parted, it stopped raining and in between the puddles and sunshine, we watched Amy Mcbride from the Tacoma Art Commission rev up the steamroller in the parking lot of Kings Books and print the famous Wayzgoose prints created from 3×3 foot linoleum cuts created by local artists each year for the event. The Wayzgoose! Letterpress and Book Arts Extravaganza is one of those rare events which lives up to its name. Turning my back on the cheers as another successful proof was pulled from beneath the steamroller, I entered the crowded interior of Kings Books to find people standing shoulder to shoulder, some in line, just to pull off their very own printed piece whether it by inking up a brussels sprout (yes you read that correctly) or from an array of miniature platen presses that seemed to grace every table. If printing your own isn’t your thing, consider purchasing a limited edition multi-color woodblock or linoleum cut print from one of the local artists or perhaps a broadside from Jessica Spring of Springtide Press, who founded Wayzgoose ten years ago. This year’s Wayzgoose has come and gone, but make plans for April of 2015. I know I will be there; Rain or shine. This entry was posted in Exhibits, Member News, Past Events. Bookmark the permalink.